December 26, 2015 – Mister Journalism: "Reading, Sharing, Discussing, Learning"
The Michigan House and Senate pulled a fast one last week and Governor Snyder needs to do the right thing for libraries, schools, and parks by Vetoing SB 571. Library boards would be fined thousands of dollars of sending out a newsletter if it shares information about what is on your local ballot. We need honest and transparent elections. It is both anti- free speech and anti- good government. Don’t let the politicians in Lansing force librarians to hide information about what is on your ballot! Join thousands of citizens from around Michigan and tell Governor Snyder to Veto SB 571 because information needs to be free by signing the petition today. 35 degrees here in beautiful downtown Wayland Michigan USA and not getting any warmer from here on today – so no sense in waiting any longer to take in my “daily constitutional” — 56 days in a row now since November starting the day before my 11/2 birthday — guess I’ve made it a solid habit don’t you think? Oh, btw – tale of the scale was 242.2 this morning – down from 279.9 in mid-August… 37.7 pounds. Twelve (12) pounds to reach 229.9 what I weighed in 1980 when I graduated from MSU. Women Are Getting Into Shooting, But Not In The Way That Keli Goff Wants You To Believe. Whether she knows it or not, feature writer for The Beast, Keli Goff, has just published an article about the alleged increase of women in the shooting sport which reads right out of the NRA-NSSF playbook on how to win friends and influence people about guns without knowing anything about guns. Keli has unquestioned liberal credentials and a piece she did last year on guns and ghetto crime said all the right things from a GVP perspective, but this time she seems to have gone into the deep water and I’m not sure that her life-jacket can keep her afloat. Source: Women Are Getting Into Shooting, But Not In The Way That Keli Goff Wants You To Believe. Progressive Education Experiment: Wonder what happened to the graduates of Arthurdale HS? Eleanor Roosevelt with an Arthurdale High School graduating class. Arthurdale is an unincorporated community in Preston County, West Virginia, United States. Arthurdale was named for Richard Arthur, former owner of the land on which it was built, who had sold the land to the federal government under a tax default. 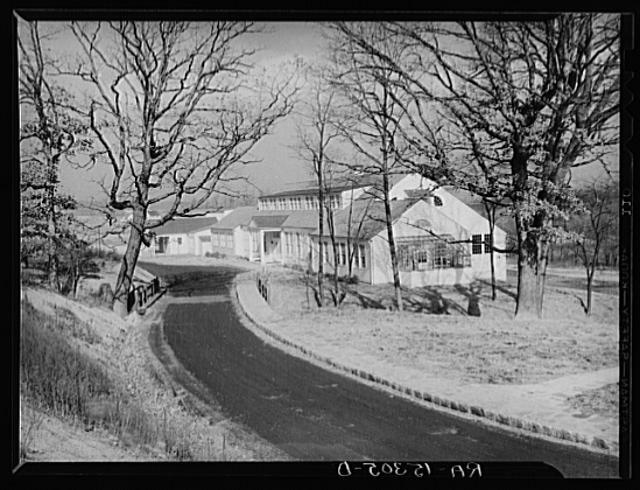 Arthurdale was the first of many New Deal planned communities established under Franklin D. Roosevelt‘s administration. It was intended to take impoverished laborers, farmers, and coal miners and move them to a modern rural community that would allow them to become economically self-sufficient. The idea for such a self-sufficient community originated when Eleanor Roosevelt learned through her friend,Lorena Hickok, of a plan to relocate a group of West Virginia coal miners to a nearby farm with the intention that they could combine subsistence farming with simple industries to reclaim their economic footing. Mrs. Roosevelt was so passionate about the concept that she brought it to the attention of her husband, who decided to place the project under the direction of the United States Department of the Interior. From 1934-1936, Elsie Ripley Clapp served as administrator of the Arthurdale School. A student of John Dewey, Clapp saw the school in Arthurdale as a great opportunity to create a community school. Students learned through hands-on activities rather than theoretical learning and undertook projects related to agriculture and construction. The students also learned about their Appalachian culture. First Lady Eleanor Roosevelt donated books, money, and supplies to the school. 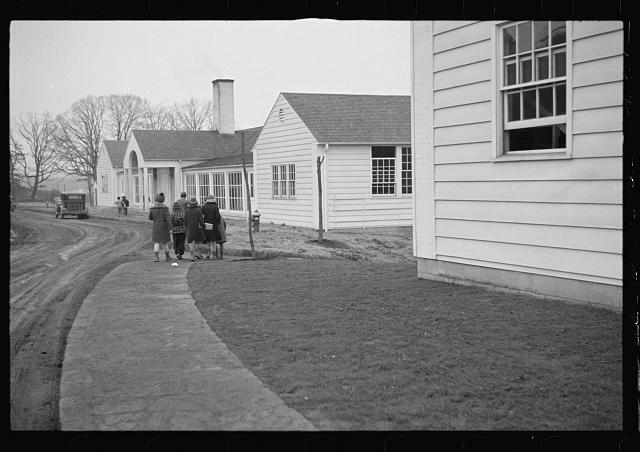 When the school opened in the fall of 1934, the school buildings had not been built. Determined to begin the education of the children in Arthurdale, Clapp set about placing the students in various community buildings. 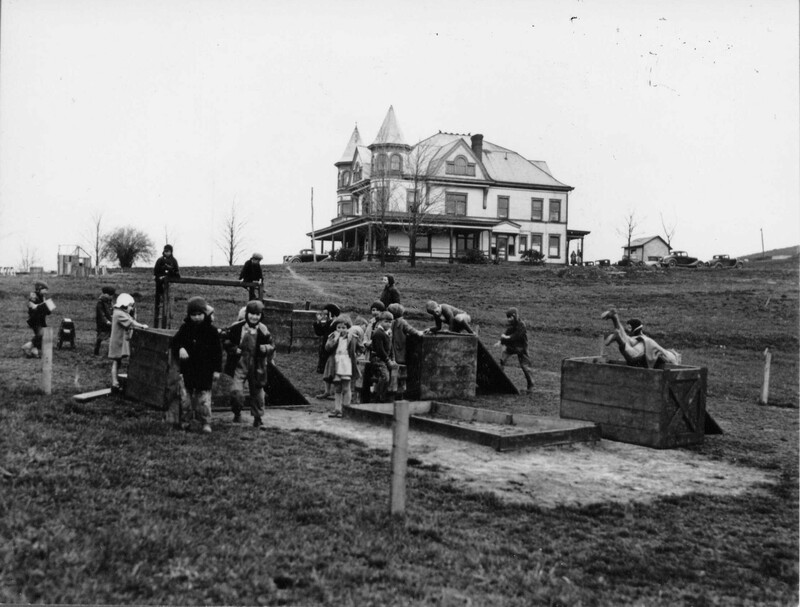 The elementary school held classes in the Arthur Mansion, high school students learned in the Center Hall, and the nursery school filled the space newly completed by homesteaders at the center. In addition to the buildings not being completed, the books and supplies ordered by Clapp and her teachers, had not arrived. 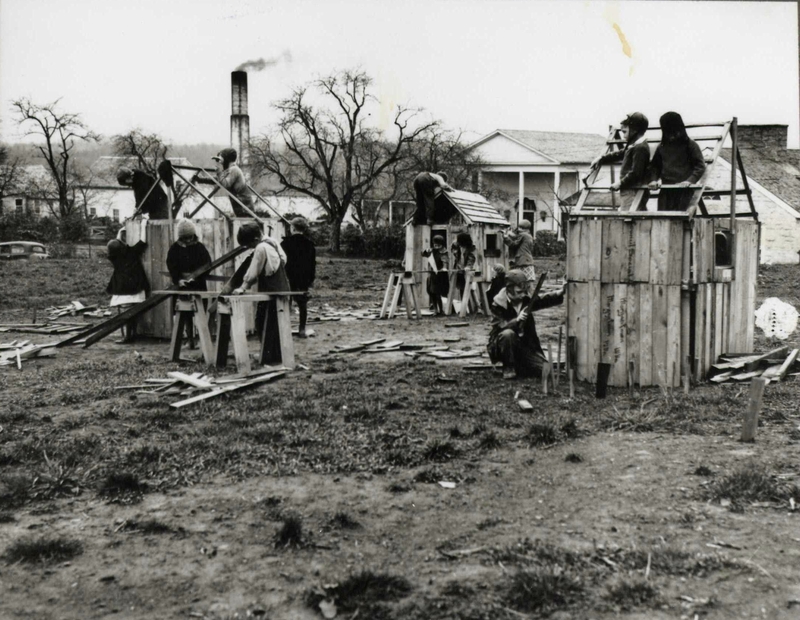 The teachers improvised and put their progressive teaching plans to work. Second grade learned about construction by watching the workers build the homes throughout Arthurdale and put their knowledge to practical use by building their own homestead community. 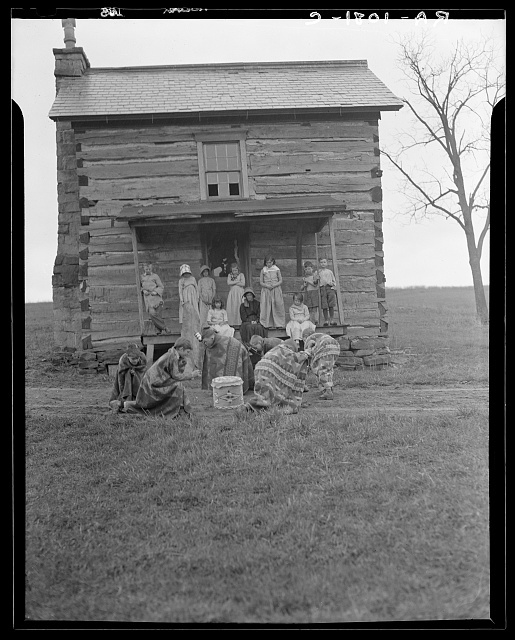 Fourth grade studied pioneer life in the old Fairfax cabin. 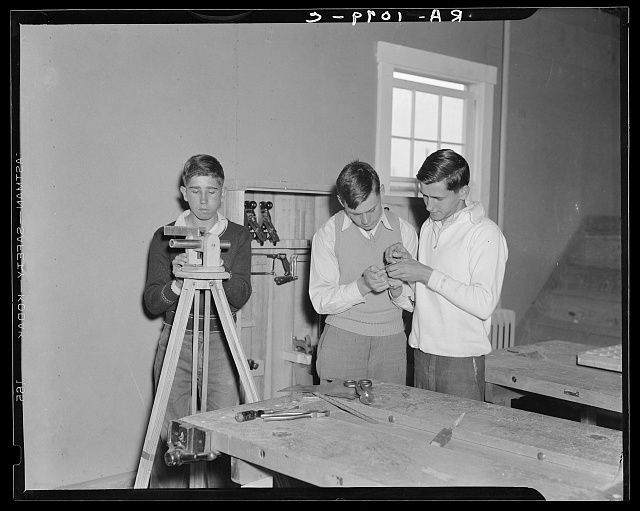 High school students combined disciplines and created surveying equipment through their math, science, and shop classes; they eventually surveyed Route 92 for their final project. Elsie Clapp helped design the school campus, which opened in the fall of 1935 and featured a high school, cafeteria, gymnasium/auditorium, elementary school, primary school, and nursery school. Educational advisers to the Arthurdale project included Lucy Sprague Mitchell of Bank Street College, Dean William Russell of Teachers College, Columbia University; John Dewey, Eleanor Roosevelt, Clarence Pickett, and W. Carson Ryan, a future editor of the journal Progressive Education. 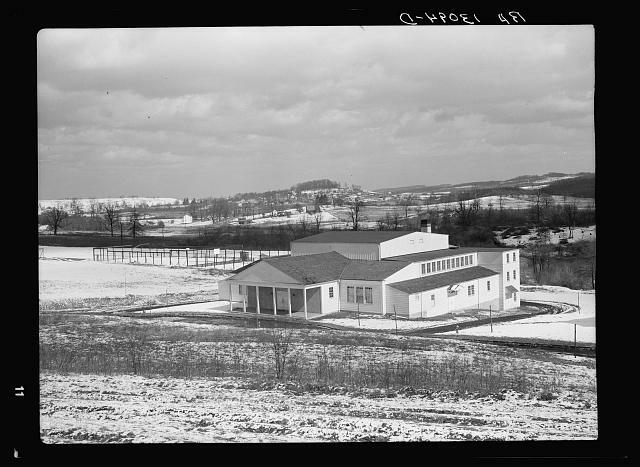 From 1936 to 2000, four of the original Arthurdale school buildings were under the control of the Preston County Board of Education and used as a middle school and elementary school. In 2000, the PCBOE transferred the high school, cafeteria, and elementary school buildings to Arthurdale Heritage. A Save America’s Treasurers grant completed in 2006 provided for stabilization and mothballing of the buildings until the complete restoration of the buildings can take place. The Arthurdale Gym is still being used by Valley Elementary. The Power Elite is a book written by sociologist C. Wright Mills in 1956. In it Mills calls attention to the interwoven interests of the leaders of the military, corporate, and political elements of society and suggests that the ordinary citizen is a relatively powerless subject of manipulation by those entities. The structural basis of The Power Elite is that, following World War II, the United States was the leading country in military and economic terms. According to Mills, the Power Elite are those that occupy the dominant positions, in the dominant institutions (military, economic and political) of a dominant country, and their decisions (or lack of decisions) have enormous consequences, not only for the U.S. population but, “the underlying populations of the world.” Mills outlines the historical structural trends that led to the ascension of the power elite as involving a concentration of economic power and the cultural apparatus in the hands of a few, the emergence of a permanent war economy in the U.S. during and after WW2, the emergence of a bureaucratically standardized and conditioned (controlled) mass society and a political vacuum that was filled by economic and military elites. Due to the interchangeability of top positions within these three institutions, the members of the power elite develop class consciousness and a community of interests guided by a militarized culture, or what Mills described as the military metaphysic. The book is something of a counterpart of Mills’ 1951 work, White Collar: The American Middle Classes, which examines the then-growing role of middle managers in American society. A main inspiration for the book was Franz Leopold Neumann‘s book Behemoth: The Structure and Practice of National Socialism in 1942, a study of how Nazism came into a position of power in a democratic state like Germany. Behemoth had a major impact on Mills and he claimed that Behemoth had given him the “tools to grasp and analyse the entire total structure and as a warning of what could happen in a modern capitalist democracy”. This chapter provides a description of the power elite and the mechanism through which it acquires and exercises its power on a national level. He describes the contemporary means of power as the hierarchies of state, military and the big corporate institutions. Other, previously decisive institutions such as family and religion are pushed aside in the contemporary United States. They adapt to contemporary life, which in turn is set and determined by the new means of power. Wealth, power, and popularity, in this system, attach to the positions that individuals occupy, and not to the individuals themselves. The power elite of the US, which never faced competition due to the absence of feudal structures (aristocracy and religion), monopolize power from the get-go. It becomes a caste within the upper classes, and makes all decisions that have important consequences. It is not a group of rulers whose every decision is correct and every consequence of such decisions is as expected. It is limited by the means of power, the techniques of power, and the means of communication. However, their limitations are much less compared to previous ruling classes, due to the expansion and centralization in the means of power. The power elite is much more unified and powerful than the “mass society”, which is fragmented and impotent. Meet Bruce Jackson, the man who helped sell the Iraq War, got rich in the process and moved to Bordeaux. Last September, a man named Bruce Jackson hosted a party for his vineyard’s 2014 wines at his 18th-century Chateau Les Conseillans, which sits in the rolling hills of Bordeaux. The afternoon before the party, he took some guests, among them a documentary filmmaker and former colleague of mine, for a tour of the estate ground, wearing a bland blue suit that matched his mild, drab persona. With his short, carefully combed gray hair, he resembles the conservative columnist George Will, or any number of the people floating around Washington DC’s interlocking social circles of foreign policy think-tankers, defense contractors, and lobbyists, which are in fact the exact circles he moves seamlessly in. There was a smell in the air of grass, lilacs, and grapes from Jackson’s vineyard, which includes a Merlot plot dating back to 1953. Much of the chateau itself was erected in the 1700s, but it now boasts haute bourgeois furnishings with a 2,000-square-foot kitchen (with brand new steel sinks and Swedish faucets). The property includes a pine forest and an impeccable pool whose water appears a dark, warm blue. For the guests that evening, there would be duck confit, crawfish canapés, and a three-piece jazz band. My former colleague, hoping to prod Mr. Jackson on foreign policy, turned the conversation to Iraq, where that very day 17 people had been killed in bombings and shootings and a mass grave containing the bodies of 15 truck drivers had been discovered. That sort of bad day has been horrifically common since US troops deposed Saddam Hussein in 2003, with the Islamic State beheading journalists, conducting mass executions of Iraqi soldiers, and attracting recruits from across the West with horrific propaganda videos.